Kristen Hanley Cardozo wearing one of her own designs, Sunniva. 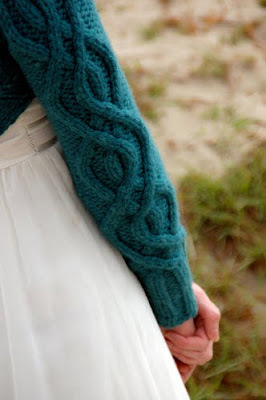 I first came across Kristen's work while looking for a pattern to knit for my friend, Michelle's birthday. I found Clothilde. This pattern's fluid, feminine yet not fussy design is what caught my eye. I also liked the fact that Kristen is local to A Verb for Keeping Warm. It was a very sweet knit, well written, and I had it finished in time for Michelle's birthday. Gold star. Then, Kristen came out with Arabella. A fantastic shawl with all sorts of crisp edges and almost Arabaresque lattice-work motifs. Plus, Kristen created something really wonderful in her act of writing the pattern. 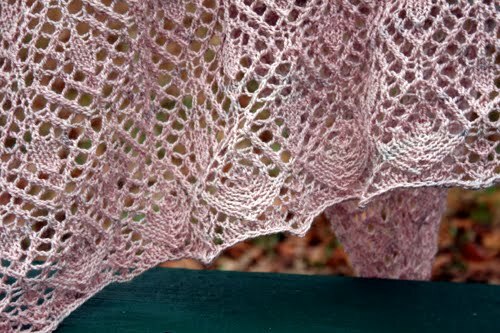 She gives the knitter a multitude of options as to how large to knit the pattern, what the mid section of the pattern will look like, and various edgings to apply. 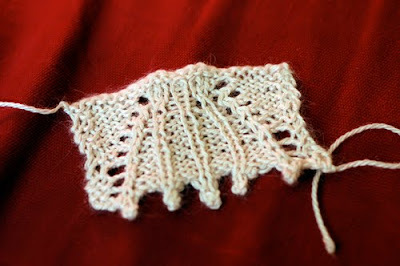 I really wanted to teach a class dedicated to spinning and knitting lace. Arabella was the perfect choice given that Arabella has a wide choice of yardage and each knitter could take part in the design of her shawl. So, when it came time to choose designers for Pro-Verbial, Kristen instantly sprung to mind. I am thrilled that she accepted. Here's her interview. Enjoy. Pretty much as soon as I started knitting, I knew I wanted to make original designs. I had visions of sweaters made for my body in colors I liked and it was all pretty intoxicating to think of. Since average is a myth, most of us have encountered the frustration of trying to find clothing that fits and flatters our bodies, and being able to make my own seemed to offer a solution to my disproportionately long arms and torso! Oh, this is tricky! It's usually the one I'm imagining as my next project. Of the ones that are already out in the wild, I'd have to say it's Arabella. I'm very pleased with all the various options in that pattern, from yarn weight to written or charted directions to the different edgings, and I had a lot of fun making it. What drives you to design? What makes it an integral part of your life (if it is, if not what is)? I have always had a need to create things, but after my kids were born I found it very difficult to get back to what I used to do, which was painting in oils. The time commitment, the mess, and the potential danger of wee people with toxic materials made it so that I had to look out for something else to do with my hands. I settled on knitting because it was something I could set down and pick back up without disaster, and design naturally followed as a creative outlet for all the ideas floating around in my head. My very favorite moment is when I've finished knitting something new and blocked it and the idea in my head is now a physical reality. It can feel like a miracle to see something turn out the way you imagined it. I have had an idea for a while now about a series of fine art sweaters that I'd love to make. Wholly impractical, but all of them about women and our changing role in society based on historical fashion in conjunction with ideas about women from the same period. Napoleon said that women should stick to their knitting. Well, I intend to, but I'd like to talk about more than knitting with my knitting. Among my ideas for the fine art sweaters, I'd like to make a twin set from the fifties with hidden pockets, a sweater for mothers with a multitude of arms and shapes, and a Napoleonic spencer with a response to Napoleon written into the intricate lace. Why have you chosen yarn as your medium v. woven fabric, clay, etc.? Largely for the reason stated previously - I could set it down without something awful happening! It was a very practical decision, but I could not have foreseen just how tempting yarn was going to turn out to be. Oh, this is tricky! I actually have thought about this a lot, but I think in too-literal terms - it's hard to imagine a time period I'm interested in in which my eyebrow ring and short hair wouldn't brand me as a freak almost instantly. It's also hard to avoid thinking in modern political terms. My marriage and family would be openly condemned in so much of the past. I want to go hang with Doctor Who for a bit, I think, and do time travel that way, so I can stop being a literalist spoilsport! When I’m designing I can’t live without: My calculator and reams of paper! I am constantly doing a little extra math and jotting things down. My favorite tool to assist in designing is: Excel. It took me a good while to learn how to use it, but I've never looked back. I love being able to input my numbers and then have almost instant grading. I also use Excel for making lace, cable, and colorwork charts. OK, this is a weird answer, but my biggest ongoing challenge is returning to older patterns. A lot of my early patterns were barely patterns at all. I started off on Craftster and would just try to write up a general outline of an original design on my blog, and a lot of these early works are sloppy and poorly written. I want to rewrite them, but I'm on to new things and I only get around to one old thing at a time. I would love to be able to bring all the old stuff up to my current higher standards. I'd really like to build up a larger portfolio and be able to work on some of those more impractical and theoretical projects mentioned earlier. It would be exciting to be a designer of things useful and things artistic both. I have a book about the history of fashion through about 1910 that I refer to quite a lot for ideas on shaping and structure, and a folder I keep on my computer labeled Inspiration filled with pictures of garments and colors and people that interest me. Anything that strikes me as something I'd want to wear is fodder for ideas, and anything that strikes me as fun to knit is fodder for a stitch pattern. Wool! I love how sheep hair can yield so many different textures and fabrics. Oh, goodness, maybe Lisbon. It looks lovely from photographs, it's got a lot of geographic similarities to California but a different culture and history, and I find a lot of the colors and fabric patterns I've seen from Portugal to be intriguing. The yarns themselves are beautiful. I first encountered Verb some years back at a Berkeley fiber festival, and the colors were stunning. I liked the fact that Verb was local to me, and I love the way the natural dyes create a different color quality than other dyes. I work with a lot of yarns that use different dying methods, and I love those yarns, too, but Verb has a look all its own that permeates everything from the top down. My favorite thing is finding out that a plant or kitchen ingredient that I'm familiar with in one context has this whole other side I never knew about! It's very exciting to think that saffron can make my rice taste great and then turn around and give me something beautiful to wear. It's like a secret identity. By day, mild mannered food enhancer - by night, crusading color hero! All of the yarns sounded wonderful, but there was a stitch pattern that sprang instantly to mind when I started thinking about what I wanted to make, and after swatching, I knew I wanted good stitch definition and drape, but also something of a halo. The Alpaca/Silk/Cashmere covers all those bases! I'm a Bay Areaite, and Verb's a Bay Area company! I wanted something that made me think of the San Francisco Bay, so I started working on a branching shell pattern for the edges of the shawl. Stay tuned for our next interview with Mr. Stephen West. What a wonderful interview, Kristine!!! I'm so looking forward to Kristen's design and your colorway. Kristine, what a great interview and very insightful. Kristen's designs are beautiful and how exciting to get some hints of what's to come. The waiting is simply agonizing to see...will I get into the Pro-Verbial Yarn Club...will I get to see Kristen's final design....will I get to see what colorway and yarn will be used?